Next year’s British Fantasy Awards ceremony will be at Fantasy Con: Cities of Steel in Glasgow on October 20, 2019. Congratulations to Joe Hill, who just won the British Fantasy Award for best collection:STRANGE WEATHER. That’s my boy, and I couldn’t be more proud or happy. The Award winners for each category will be announced on 21st October at FantasyCon 2018. The British Fantasy Society has announced the results of its 2017 Short Story Competition?. The competition judge Allen Ashley also awarded a fourth place as “highly commended” — “The Beast” by James Ellis. Ashley says he received a record-breaking number of entries, with 117 eligible stories submitted. The top three stories win prizes and all four of Ashley’s picks will appear in a future issue of BFS Horizons. The British Fantasy Society announced the winners of the British Fantasy Awards 2017 at FantasyCon 2017 in Peterborough on October 1. The winners were selected by juries. The British Fantasy Society has announced the finalists for the British Fantasy Awards 2017. Four nominees in each category were decided by the votes of BFS members, attendees of FantasyCon 2016, and attendees of FantasyCon 2017. Up to two further nominees in each category were added by the juries as “egregious omissions” under the rules. The winners will be decided by the juries, and announced during FantasyCon 2017 in Scarborough, September 29-October 1. The shortlist for the British Fantasy Awards 2016 has been released. The winners will be decided by the juries, and announced September 25 at FantasyCon 2016 in Scarborough. The jurors were appointed by the awards administrator, Stephen Theaker, under the supervision of the British Fantasy Society committee. The BFS committee itself is the jury for the Special Award (the Karl Edward Wagner Award). The winners of the 2015 British Fantasy Awards were announced October 25 at FantasyCon. The physical award is a handmade wooden bookend featuring Lee Thompson’s BFS logo, commissioned from Sarah Goss, who works in traditional woodcarving and restoration. The nominees for the 2015 British Fantasy Awards have been announced. The winners will be revealed at the awards ceremony at FantasyCon on October 25. Generally, four nominees in each category were decided by the votes of BFS members and the attendees of FantasyCon 2014 and FantasyCon 2015. The category jurors had the option of adding up to two further nominees. The jurors will now pick the winners. The British Fantasy Society committee will select the winner of the Karl Edward Wagner Award. The winners of the 2014 British Fantasy Awards were announced September 7 at FantasyCon 2014 in York. The nominees in each category were decided by the voters of the British Fantasy Society, FantasyCon 2012 and FantasyCon 2014, with the juries having a discretion to add up to two further “egregious omissions” in each category. The winners were decided by the following jury members. Fantasy novel: Gary Couzens, Laurel Sills, Matthew Hughes, Neil Williamson and Selina Lock. Horror novel: Cate Gardner, Jim McLeod, Mark West, Pauline Morgan and Thana Niveau. Novella: Aleksandra Kesek, Jo Thomas and Paul Holmes. Short story: David Tallerman, Matthew Hughes and Pauline Morgan. Collection: Matthew Hughes, Ole Andreas Imsen and Pauline Morgan. Anthology: Carole Johnstone, Gary Couzens and Matthew Hughes. Small press: Dave Brzeski, Elaine Hillson, Elloise Hopkins, Rachel Kendall and Rhian Bowley. Non-fiction: Djibril al-Ayad, Emma Newman and Jason Arnopp. Magazine/periodical: Aleksandra Kesek, Donna Bond and Jim McLeod. Comic/graphic novel: Jay Eales, Jennie Gyllblad and P.M. Buchan. Artist: Jennie Gyllblad, P.M. Buchan and Rachel Kendall. Film/television episode: Adrian Faulkner, Catherine Hill and Gary Couzens. Newcomer: Douglas Thompson, Ian Hunter and Lizzie Barrett. The Karl Edward Wagner Award was decided by a vote of the British Fantasy Society committee. 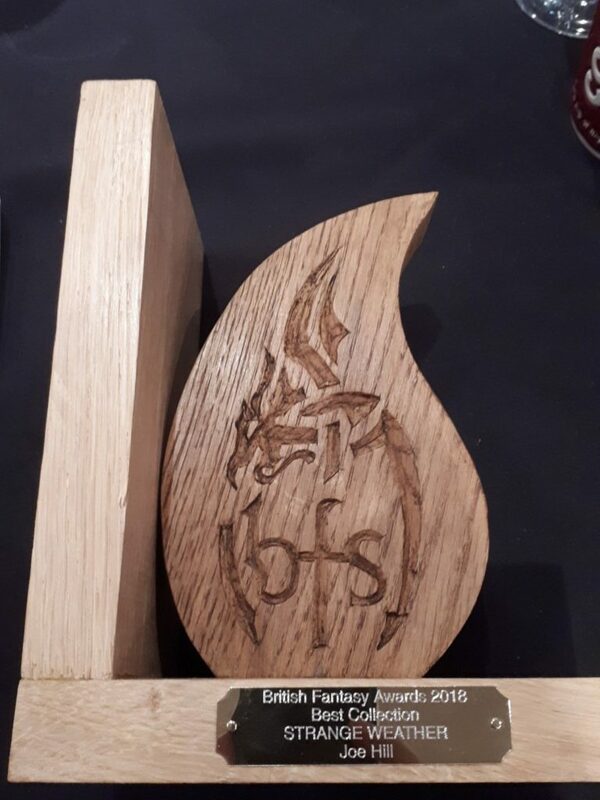 The physical award this year, a handmade wooden bookend featuring Lee Thompson’s BFS logo, was commissioned from Sarah Goss, who works in traditional woodcarving and restoration.